This is a guest post by Bart Jellema. Bart attended the Web Directions South conference for The Next Web Australia and below is his report on some of the main attractions of the day. 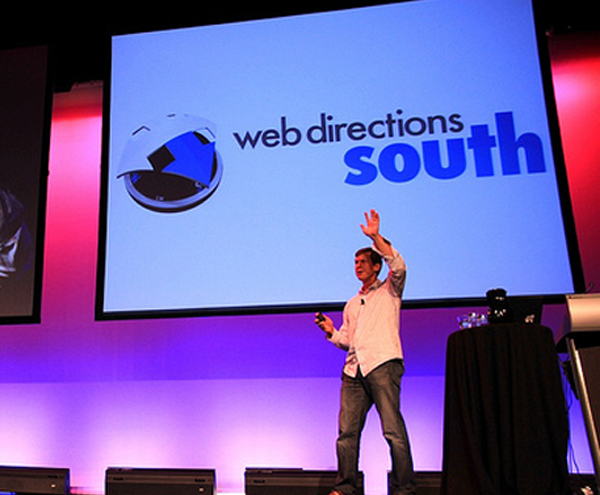 Today was the first day of the Web Directions South conference, in Sydney. The day started off with a keynote speech by Scott Thomas (SimpleScott) who was the design director of the Obama new media team. His presentation was concise and to the point and explained the impact of the consistent design and messaging of the Obama campaign. So it goes to show that design decisions can be so important that they can effect a presidential election and ultimately change the world. Scott also explained the pains suffered in getting his book Designing Obama published but said it was all worth it. There was plenty of time left after the keynote for Scott to take questions and the audience fielded some interesting ones. In response to the question “How successful was the online ‘vote for change’ campaign”, Scott explained that they managed to register one million new voters and it helped win the state of North Carolina. During the beginning of the campaign it wasn’t always clear who had to sign of on things and this became an issue when they decided to combine elements of the presidential seal with the Obama logo, which caused quite a stir and was even brought up by John McCain later in the presidential debate. This was the biggest slip-up that Scott could recall from the campaign. Digital Eskimo brought a digital whiteboard powered by a projector, 2 wiimotes and a low powered UV pen. I’ve seen the video for a Low-Cost Multi-touch Whiteboard using the Wiimote a while back, but it was nice to see this in action. For anyone who is in town, tonight there will be a choice of events, starting with the official opening night drinks reception from 5pm until 7pm, followed by Code Wars at Crown Plaza Bar. There is also a Startup Networking Party at the Home nightclub in Darling Harbour.